Used by OSS and special forces in WWII, Korea, Vietnam. Scuttle is that they are still in use. Fitted with integral suppressor. 45 ACP used by OSS in WWII, Korea, and Vietnam. Max’s grandfathers side arm the revolver in .45 Schofield. Now that is a mouth full so I just call it the Schofield. (Review by non other than Mike Beliveau, editor of Guns of the Old West magazine). Uberti now makes these and I have the pleasure to own one. Every time I hold it I think back to the old west. Max’s side arm when flying as a Naval Aviator. 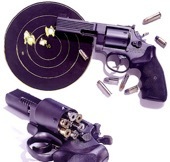 Made by Phillips & Rodgers (NASA engineers), this revolver can chamber, fire, and extract almost any cartridges in the .38/9mm/.357 ammunition range. My favorite gun, which I am lucky enough to own. Suppressed 45 ACP. Very hardy and quite gun with that powerful, but subsonic, .45 ACP. Suppressed 9mm semi and fully automatic machine gun. Currently used by all special forces. The cannon: Triple barrel Hunting Rifle. Max also inherits this beast. The pictured to the left is from Chiappa’s Tripple threat 12 guage shotgun. I could not find a picture of a triple barrel hunting rifle because they are pretty rare. I had the luck that my neighbor in Venezuela was an avid hunter and collector. I naturally gravitated to the triple barrel he had locked behind glass in his gun room. He let me hold it (sucker was heavy, I was only 10 years old) I don’t recall the caliber, but for my book I chose the western 45-70. .22 caliber. This is the same gun that was given to the U2 pilots in the 1960’s. And it becomes our hero’s gun when his father leaves it to him. Interesting how such a small caliber gun can do so much damage when in the right hands!